The pattern on this ice cream tray, Santa Maria, made its debut at the 1893 World’s Columbian Exposition, held in Chicago to commemorate the four hundredth anniversary of the discovery of the New World. It is shown in the 1893 L. Straus & Sons catalog where the shape of this tray is given as no. 442. The Santa Maria pattern was never patented. L = 16.25″ (41.3 cm), W = 9.25″ (23.5 cm), h = 2.25 (5.7 cm), wt = 8 lb (3.6 kg). Sold for $500 in 1990. Lazarus Straus immigrated to this country from Germany (Bavaria) in 1852 and established a “business of importing and selling fine china and glassware” (Revi 1965, pp. 112-113). In 1874 he and his sons, Isidor and Nathan, leased the china and glass shop in the R. H. Macy department store, New York City. Two years previously their family business had become known as L. Straus & Sons. Sometime after 1874 the Strauses acquired a financial interest in Macy’s (note 1). Although L. Straus & Sons had operated a cutting shop in the Macy department store as early as 1880, in 1888 the company established a second shop (and showroom) at 44 Warren St. “to avoid a potential conflict of interest because of their partial ownership in Macy’s”. The cutting operations at the department store continued after 1888 and after Macy’s moved, in 1902, from its original location on 14th St. to its present site, Broadway at Sixth Ave (Herald’s Square). Initially the cut glass sold at Macy’s was not identified as Straus cut glass. In 1885 the American Institute awarded a diploma and “medal of superiority” to R. H Macy & Co. “for cut and engraved glass ware” with no mention of L. Straus & Sons. The cut glass sold by the store probably was first identified as “Straus cut glass” when the Straus family acquired full ownership of the store in 1896. Subsequently, Macy’s identified much of its cut glass as “Straus cut glass” in its catalogs until at least 1912. During the 1890s and the early years of the twentieth century L. Straus & Sons produced a great quantity of cut glass at various locations. It was displayed at the Warren St. establishment which eventually was expanded to include 42, 46, and 48 Warren St. as well as a connecting store at 116 Chambers St. At one time the company had branch offices in London, Paris, Berlin, and Yokohama. Within three weeks a new factory opened on Thirty-sixth Street and North River where [it] remained until August of 1905. The cutting operation then moved to 794-800 Tenth Avenue near 54th Street. Once again fire completely destroyed the Tenth Avenue cutting shop on March 1, 1912, and the cutting operation was moved to Debrosses, Vestry and Greenwich Streets. The last ad found, to date, giving this factory location [can be found] in the December 18, 1919 [issue of] Crockery and Glass Journal. We do not cheapen the finish of our Cut Glass by using Chemicals. The use of the old time polishing wheels and buffs is a more costly process but it produces a lasting brilliancy and not a mere temporary gloss. All Straus Cut Glass [is] finished and polished by hand only. 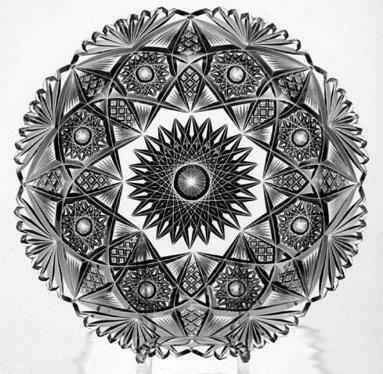 When, in 1897, a new pattern, Wales, was introduced, the company boasted that the pattern “has no trite or antiquated features like Strawberry Diamonds [i.e., cross-cut diamonds] or Fan edge.” This design philosophy — which was shared to some extent by other companies as well — can also be seen in the patterns Straus patented at this time. The Napoleon and Talisman patterns of 1895 were the last patents to use the cross-cut diamond motif and the fan-edge style to any extent. Another change in the company’s design philosophy occurred about 1910 when exclusively “rich-cut” patterns were replaced by patented patterns that included realistic engravings, mainly of flowers. “Figured” blanks and acid polishing, as well as some of the realistic patterns, can combine to discourage today’s collector who wishes to add L. Straus & Sons cut glass to his or her collection. When these cheaper products are found one needs to remind oneself that high quality cut glass made by this company during the nineteenth century is still available, although it often is not recognized and marketed as Straus cut glass. Rose bowl cut in the Venetian pattern, the first pattern patented by L. Straus & Sons. Designed by Benjamin Davies, it was patented on 11 Dec 1888. D = 8″ (20.3 cm), H = 7″ (17.8 cm), wt = 5.5 lb (2.5 kg). Sold for $475 in 1988. 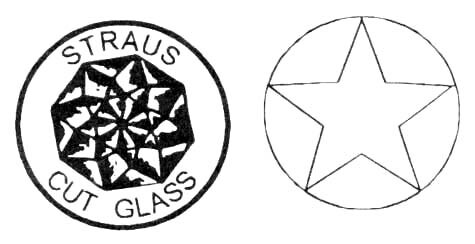 The only trademark in use by L. Straus & Sons during the brilliant period of American cut glass is the one shown on the left, below. It is easy to see how this mark, which was used only on paper labels, was erroneously interpreted by early investigators as having been simplified for use as the acid-etched star-in-a-circle trademark shown on the right. This latter trademark, however, was, in fact, registered by the Libbey Glass Company in 1901. It was used only on plain blanks that Libbey sold to various cutting shops, including — at least occasionally — L. Straus & Sons. As a result, pieces cut by Straus can sometimes be found with the star-in-a-circle trademark. The vast majority of Straus cut glass, however, is unmarked. Therefore, when the star-in-circle trademark is found on cut glass, there is an excellent chance that the cutting was not made by L. Straus & Sons. Identification of authentic Straus cut glass is made by referring to the two catalogs listed below and to the patent drawings found in Revi (1965, pp. 112-123) and at the USPTO Web site. 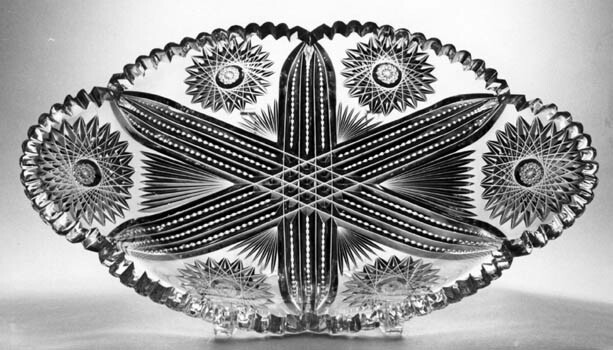 Celery tray in the Imperial pattern, the second pattern patented by L. Straus & Sons, cut on shape no. 233. Designed by Hermann Siegel and patented in 1892. L = 11.25″ (28.6 cm), W = 4.5″ (11.4 cm), wt = 2.75 lb (1.2 kg). Sold for $175 in 1990. 1893: L. STRAUS & SONS. A catalog, with no original prices, reprinted by the American Cut Glass Association in co-operation with the Smithsonian Institution Libraries. 1987, v + 37 pp. 1884-1911: STRAUS — MACY, RICH CUT GLASS CATALOG. A collection of patterns and shapes as they appeared in contemporary trade journals and in catalogs issued by R. H. Macy & Co., the latter with original prices. Published by the American Cut Glass Association. 2000, xxxiv + 134 pp. 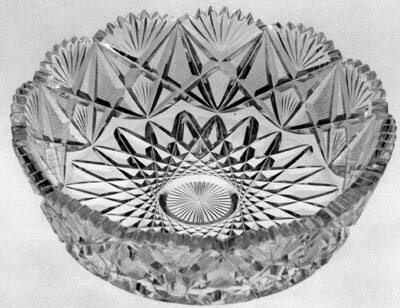 Salad bowl in the Capri pattern, the third pattern patented by L. Straus & Sons, cut on shape no. 164. Designed by Benjamin Davies and patented in 1893. D = 9″D (22.9 cm), H = 3″ (7.6 cm), wt = 4 lb (1.8 kg). Sold for $175 in 1993. 1. 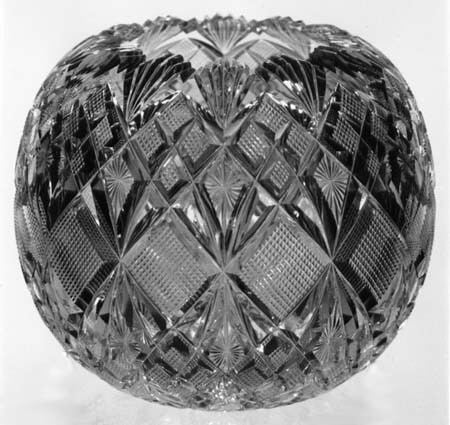 See Carlson, C.E., 2000: The Macy — Straus cut glass connection, in STRAUS — MACY, RICH CUT CATALOG (American Cut Glass Association, pp. vii – xii) for the direct quotations given in this Historical Sketch, as well as for factual material concerning the cut-glass operations of L. Straus & Sons. The AMERICAN NATIONAL BIBLIOGRAPHY (Oxford University Press, 1999) contains excellent, up-to-date biographical information on the Straus family by Susan Hamburger (see entry for Isidor Straus, Vol. 21, pp. 6-7). This compilation is largely based on the J. Stanley Brothers, Jr. volumes of patented material on file at the Rakow Library of the Corning Museum of Glass as well as the U. S. Patent and Trademark Office’s Web site, together with a reprinted Straus catalog from 1893 and a composite catalog, STRAUS — MACY RICH CUT CATALOG, both published by the American Cut Glass Association. Revi’s early work (1965, pp. 112-123) has also been useful. Craig Carlson has examined trade journals from the period when L. Straus & Sons was active, and he has kindly provided data that have been included in this table. Names within quotation marks — “coined” names — should no longer be used when official factory names become known, but because several of the catalog names listed here may be new to many readers their “coined” names are also given, where known. According to the 1893 Straus catalog patents were “applied for” for the Isabella, LaRabida, and Granada patterns, but the actual patents have not been found. Perhaps the applications were rejected by the Patent Office. Also, some investigators have interpreted Revi’s remarks on pp. 112-113 of his book (Revi 1965) as an indication that the Americus, Electra (“Ulysses”), and Peerless patterns (all shown in the 1893 catalog) were also patented, but no evidence has been found to support this contention. All patents were assigned by their patentees to the company, except those marked with an asterisk (*). These patents were retained by the patentee, Hermann Siegel. Plate cut in the Napoleon pattern. Designed by Benjamin Davies for L. Straus & Sons as patent no. 24,202 which was granted on 16 Apr 1895. D = 9″ (22.9 cm), wt = 1.5 lb (0.7 kg). Sold for $175 in 1988.